Death is coming, and it's coming large. This grim reaper needs no dark shadows or flickering lights. There is no slender ghoul lurking just outside the periphery of vision. Where one would expect shrill violins there is thrilling chiptune. The coming darkness isn't a metaphor—it's the gaping maw of an enormous space worm, and I'm a swipe away from losing everything. An unassuming little endless runner variant funded through Kickstarter for a mere $3,200, Golden Ruby Games' Worm Run could be classified as survival horror if you tilt your head just right. It's an anxiety generator of the highest order, in which your own mounting terror is your worst enemy. It looks so innocent. Well, aside from the worm. You are Space Janitor Zeke Tallahassee, trapped in an ever-changing, procedurally-generated labyrinth. A bloodthirsty space worm has caught your scent, and its capability to eat its way through solid rock far outclasses your ability to run, jump and climb. Your job—your only hope, and not a very good one at that—is to make your way through the labyrinth, staying one step ahead of those irresistible jaws as you collect gems to purchase upgrades and power-ups that might help you get a few steps closer to freedom. So freedom doesn't really exist. Zeke doesn't know that. As threatening as it might be, the worm isn't the primary source of tension in Worm Run—it's the controls. Movement is entirely swipe-based, a control system that's nowhere near as precise as your pounding heart would hope. In any other game such a scheme would be considered a liability. Here it serves to heighten the suspense. As I delved further and further into the game's progressive environments I found myself begging the controls to work for me. I pleaded as I slowly ascended a twisting mineshaft, the creature so close I could feel its hot, fetid breath washing over me. Power-ups—bombs, ice, spring shoes and the like—only offer brief respite, gained ground quickly lost amidst those twisting corridors. Worm Run is not a traditional horror game, and that's probably for the best. That sort of horror quickly overwhelms to the point where I have to put the controller down to catch my breath. This is a happier sort of terror, an intoxicating anxiety that keeps me coming back for more sweet, wormy death. 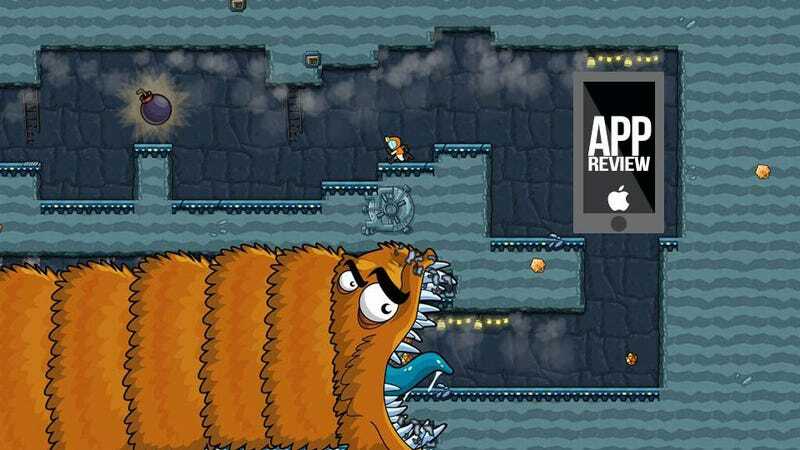 Keen-eyed readers will realize I placed the app review icon in the worm's path. It did not help.